Perfect for Halloween décor or haunted houses! With this reapers miniature size it can be used to create the effect of a ghoulish child swinging from a tree. 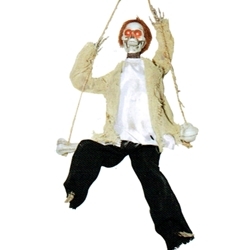 The animated reaper on a swing is colored as pictured. Decoration measures 17” tall. Sound activated. Requires 3 “AA” batteries (not included).